An excellent show, which demonstrates the battle is not really over once the combatants come home. I was not really familiar with Miles Teller before seeing this movie, but his performance was superb. I am sure we will see much more from him. As a side note, I must object to reviews from morons who admit they haven't even seen the movie. Gutty truth. Our boys getting jacked-up by our failure to run The VA properly. Maybe a good movie, will never know, as a retired Veteran I was interested until I saw Amy Shumer in it. I will in no way support anything she does. Gotta be a 5 star movie with a trailer this powerful. Will wade through hell & high water to get to theater to see. I am an old Marine, 26 months total in Viet Nam,1969-1970. JUST THE TRAILER BROUGHT TEARS UP. I will not criticize any points of this Movie. This movie is about PTSD. I will say I think it dates the time of events around 2007-2008. I agree that the flow of the movie was not tight at every transition point though this did not bother me. I got the sense those behind the movie desired to cover a lot of material in it. However, I am aware that today there are readily available veterans programs in place and a lot of information about those programs available to veterans. Some of those programs offer veterans the opportunity to begin applying for benefits, housing assistance, and employment before they exit military service. It may be the case that in smaller cities and rural areas the programs are smaller. If this applies, contact the nearest major VA Medical Center in your state and get in touch with a Veterans Services Officer (VSO) right away. Or call the nearest VA Hospital crisis line and ask for information to get yourself connected with someone who can get you on your way in one of the programs or all of them (benefits, housing, employment). PTSD and or TBI (traumatic brain injury) impacts a veteran's thought processes. So, I would not blame a veteran (diagnosed or non diagnosed) for not thinking straight when s/he needs to. Also I appreciate that desperation can set in and affect a person's judgment like the character who boarded the bus near the end of the movie. In any case, altogether, the movie left me with strong impressions - rooting for all the characters. Except the one who justified turning to drug dealing (he could not find a job so he started selling drugs), and then attempted to murder a fellow veteran and blamed it all on either military service and or the VA. And the dog fighting scenes bothered me. All the actors did an excellent job. All of them! I recommend seeing this movie. I was considering going to this movie until I saw the Leftwing LIBTARD Amy Shumer was cast in it. She has a constitutional right to spew hatred & racism and I have a right not to support anything she is involved with, along with any other actors or directors/producers who take advantage of their platform to spread their wingnut views. I wish she would keep her promise of moving out of the USA if Trump won the presidency. Here is her quote - “My act will change because I’ll need to learn to speak Spanish because I will move to Spain, or somewhere. It’s beyond my comprehension if Trump won. It’s too crazy,” she said. These also said they would leave the USA - Cher, Whoopi Goldberg, Raven-Symone, Miley Cyrus, Samuel L. Jackson, Al Sharpton, Jon Stewart, George Lopez, Rosie O’Donnell, Neve Campbell and Omari Hardwick (I don’t know who that is). 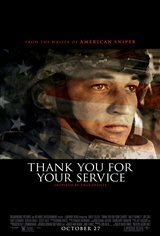 A really disturbing film , so many thousands of American solders who go serve there country only to return home , to find out that the real fight has just started . Something needs to done to take care of these Veterans , Because now it's a massive problem . Is this movie perfect? No. Does it do as good a job as it can at showing what happens to our service people once they come home and try to reintegrate into civilian society? Yes. And it does a passable job at showing how the VA is letting our people down in a massive way. Thus why heads had to roll at the VA recently. No mere movie could do the justice this topic deserves. But it does try in an honest and dignified way to let the viewer know....when they come back from multiple deployments, they have CHANGED. And they need our help to get their lives back on track after putting it all on the line......"over there". Miles Teller was great and had a strong supporting cast. I felt the story was disjointed, uneven flow, with dialogue that didn’t always ring true. I went in wanting to love it and left just liking it. So go see it on discount Tuesday or wait for vod. Very eye opening experience. Veterans are treated just like tools to be discarded when their use is done. Must see viewing for everyone. Great movie. Eye opening story about the pain our veterans are going through. Every kneeling NFL player should have to see this movie.